Vanguard Church - Bob Robinson: "Only In Cleveland." Only In Cleveland can a team finish with the best record in back-to-back regular seasons, and have the MVP on its roster, and not even make the finals of its sport. How else to explain what happened to the Cavaliers the past two seasons? 2008-09: Best record in the league, coach of the year, MVP, swept through first two rounds, out in the conference finals. 2009-10: Best record in the league, MVP, wiped out in the conference semifinals. This is not the norm in the National Basketball Association. Major professional sports teams in Cleveland, at least since 1964, cannot win it all. It is convenient and therapeutic to talk of jinxes or hexes or curses. It also is inaccurate. There are no ghosts in play. Some — mostly those sneering from the outside — maintain that Cleveland fans have created a toxic environment for their teams by constantly bemoaning their fate. That the culture of losing and woe-is-me mentality feed off each other. That Cleveland fans would not know what to do with themselves if one of the major pro teams ever won the whole thing again. To which those under the manhole covers say: "Try us. Please. Let us experience what not knowing what to do with yourself feels like." What, exactly, do the vultures expect? Are Cleveland fans supposed to pretend their teams are champions? Fans do not play the games. They react to those who do. Ownerships, front offices, coaches and players here the past 46 years continue to back their faithful into a dark, damp corner. 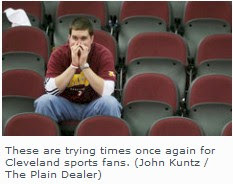 It is bad enough that Cleveland pro teams regularly lose much more than they win. But the real disappointment comes when one of them seemingly gets a good look at a title, only to have it evaporate. "The hard part is having hope, and the second you have hope, it's taken from you," said native Clevelander Tom Ray, who moved to New York City last year. "There's a sad inevitability to it." That is where many Cleveland fans are today. They realize the Cavaliers' failures the past two seasons will be bundled and ranked among the biggest flameouts in the history of Cleveland pro sports. After each of the playoff exits the past two years, instant revisionists claimed the Cavaliers were a flawed team, that the regular season doesn't really mean much. Easy to say after the team is eliminated. Bottom line: The Cavaliers were the No. 1 seed in the entire pool for two straight seasons, which means they were a favorite to win it all. Only In Cleveland can a team hold home-court advantage throughout the playoffs and lose two of three home games in the second round, as happened this season against Boston. Only In Cleveland can a team acquire a top 50 player in NBA history, Shaquille O'Neal, in a supposed fleecing — and have the fleeced team, the Phoenix Suns, go deeper in the postseason. We all know about The Shot, The Fumble, The Drive, Red Right 88, Jose Mesa. The Indians of 1996 and 2007 don't have nicknames, but they flopped with the money on the line. Now this. Of the numerous suggestions for nicknames posted online, "Le Brown Out," from kmandingo and perhaps others, will suffice for the time being. "Le Brown Out" represents a considerably bigger gag than that belonging to the 1988-89 Cavaliers vanquished by The Shot. It is much, much bigger than that belonging to the truly flawed 1987 Browns that lost in The Fumble. It safely trumps the 1980 Browns squashed by Red Right 88, a team that walked a tightrope all season. The 1997 Indians were not supposed to get past the Yankees in the first round, let alone the Orioles in the American League Championship Series. Granted, Only In Cleveland can a team have a lead in all seven games of a World Series, including one in the ninth inning of Game 7, and still lose. But a rational analysis of what led to "Jose Mesa" does not allow it to match Le Brown Out where epic flameouts are concerned. At least the 1997 Indians and their closer made it to the World Series. The Drive and the 2007 Indians are the only two that can rival Le Brown Out for mega-bit-spitting. The 1986 Browns had a Super Bowl appearance in their pocket before preventing themselves from winning and letting John Elway work his magic. The 2007 Tribe held a 3-1 lead in the ALCS with a 19-game winner on the mound at home in Game 5 — and still lost the series. Win the ALCS and you're favored to win the World Series. Not that that would have meant anything, of course. The Cavaliers of the past two seasons were being fitted for rings in some quarters before the playoffs began. Shaq wanted a ring for The King. That is why the meltdown just witnessed is so jarring. Only In Cleveland can a team have its back-to-back MVP, LeBron James, perform poorly in pivotal Game 5 of the second round (which turns out to be a blowout home loss), and the back-to-back MVP gets criticized for dogging it. Never mind that he's injured or that his teammates are giving him no help or that the defensive-minded opponent, knowing he has no help, is hounding him all over the court. He's playing poorly, so he must be dogging it. Dogging it? Surely, these critics jest. They want us to believe LBJ suddenly decided in Game 5 of a tied series to lose interest . . . on his home floor, no less? And we have proof of this where, again? Regardless of whether there is a shred of truth to it, the mere perception speaks to the magnitude of the Only In Cleveland moment. King James is on the hot seat in a region he owns. "We can't wallow in our sorrows and whine about 'only in Cleveland' forever," posted brian 929. "Sports fans everywhere are disappointed every year. Only one team can win a title; 28 or so others go home unfulfilled. That being said . . . it does seem like C-Town is the only place that can't EVER be that one team left standing." Wow. Having grown up in Indianapolis, we too had our share of mindless losing streaks. The Indiana Pacers were so bad that some fans used to sit in front of their TVs wearing paper bags during the games. When the Colts came to town and had losing season after losing season after, well you get the point, I never dreamed anything would change. And then there was a turn. The Pacers at least got to the NBA Finals. But the Colts did win a Superbowl--finally. If Lebron stays, the ownership needs to get him more help b/c that is what has killed the organization. It's like expecting the MVP Pastor to do everything. One-man shows don't work anywhere.